After a few years of architectural studies at the Polytechnic School (today the Helsinki University of Technology), Harald Hellström decided to change his profession and pursue a career in art instead. One of the various subjects he studied was drawing, as a private student of the artist P. Å. Laurén. Hellström made several study tours abroad, first and foremost in France. He first exhibited his graphic artwork in 1930. 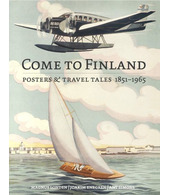 He also participated in joint exhibitions of Finnish graphic art in Moscow, Riga and Copenhagen. Harald Hellström’s work includes the coat-of-arms of Muonio municipality, featuring a silver star against a red background symbolising Lapland’s nature. In 1941, Hellström’s great interest in heraldic art resulted in the book Kort handledning i heraldik (‘A Short Introduction to Heraldry’, published by the Söderström publishing house). The book was the first textbook in Finland on the subject. Harald Hellström worked as a commercial artist and illustrator for Tilgmann’s publishing house, Kuvataide Oy, and later became manager there. He also drew a number of series of postcards.